CYCLERtest is proud to announce that its patent for the optical calibration of qPCR cyclers is now also granted in the USA. The US patent complements similar patents held by CYCLERtest in Europe and Japan. The innovative technique is based on the traceable calibration of temperature, optical detection and light of (q) PCR cyclers (excitation and emission). A truly unique method since these components are not only detected and generated separately but also in relationship to each other. By doing so, the performance of the real-time thermal cycler is monitored and calibrated like never before. CYCLERtest - a pioneer and global leader in ISO 17025 accredited (q)PCR cycler calibrations - is headquartered in The Netherlands and represented by qualified distributors worldwide. Its highly accurate calibration tools and services enable laboratories to monitor the performance of their thermo cyclers according to global quality requirements. All in order to generate reproducible, trustworthy and technical valid (q)PCR results. More information about CYCLERtest can be found on www.cyclertest.com. BIOplastics optical qPCR plastics are manufactured in our plant in Landgraaf, The Netherlands. Innovative design and skilled production practices leads to the highest visible performance in Real-Time PCR. Click here to read more. One (q)PCR disposable to fit all your 0.1 ml and 0.2 ml Fast (q)PCR Cyclers. It can be a challenge to optimize different disposables to common (q)PCR protocols. With the new 12 x 8 Tear off Low Profile Tube Strip Mat it becomes easy and the benefits are substantial. Streamline your processes by using high quality loadable plate Shell Frame Grids . A rigid frame for automation and bar-coding enables a perfect fit with designated BIOplastics products, e.g. the 8 Tube Tear Off Low Profile Strip Mat. The composed plate fits all 0.2 ml Fast as well as 0.1 ml 96 well format cyclers. 0.1 ml (q)PCR 8-tube-strips with single optical attached and indented caps which can be “clicked” into SHELL FRAME GRIDS™ enabling to equip also Roche LightCycler® 480 Real-Time Systems, and Applied Biosystems, Life Technologies™ Fast Cycler models. The EU 0.1 ml Thin-wall 8-tube strip, LP, Single Attached Optical Indented wide area Cap allows individual closure of (q)PCR tube strips. Limiting cross contamination and the possibility of signal enhancement in Real-Time PCR are two highly valued features. Designed to be used in diagnostic applications. For Real-Time applications the use of frosted* (B72810/11) or white strips is recommended. See downloadable flyer for Features / Benefits and (q)PCR cycler compatibility Charts. Why continue to use a number of different products to equip your (q)PCR cycler fleet if a “one product does it all” is at your fingertips. It can be a challenge to optimize different disposables to common (q)PCR protocols. With the new 12 x 8 Tear off Tube Strip Mat it becomes easy and the benefits can be substantial. Streamline your processes by using high quality loadable plate Shell Frame Grids . A rigid frame for automation and bar-coding enables a perfect fit with designated BIOplastics products, e.g. the 8 Tube Tear Off Strip Mat. The composed plate fits all 0.2 ml 96 well format cyclers. The EU 0.2ml Thin-wall 8-tube strip, RP, Single Attached Optical Indented wide area Cap allows individual closure of (q)PCR tube strips. Limiting cross contamination and the possibility of signal enhancement in Real-Time PCR are two highly valued features that benefit users. Designed to be used in diagnostic and clinical applications. For Real-Time applications the use of frosted* (B72910/11) or white strips is recommended. Optical Tear-off 8-Cap Strip Mat is an excellent closure option for any of the BIOplastics (p)PCR plates, and (q)PCR 8-strip tubes. The Optical Tear-off 8-Cap Strip Mat is superior in performance and handling compared to any other sealing product and is designed and tested to be used in any type of PCR and Real-Time PCR application. BIOplastics has designed and formulated a new 4 tube strip to accommodate QIAGEN® Rotor-Gene® qPCR cyclers. This new high quality 4 tube strip with attached caps works with all existing qPCR applications for Rotor-Gene® systems and provides superior reproducible results. The attached caps are easy to close and minimize possible cross-contamination. Opti-Seal™ Tear Off provides a budget friendly sealing option for (p)PCR plates and (q)PCR 8-strip tubes. Opti-Seal™ Tear Off is non pierceable and can be easily removed after the (q)PCR reaction is performed. Pressure applied by the heated lid of the thermal cycler keeps the seal well closed during thermal cycling. BIOplastics has designed and formulated a new (q)PCR plate. This new high quality (q)PCR plate does not compromise in quality or rigidness but the manufacturing process has been so optimized that the price now can accommodate small budgets. BIOplastics considers this plate as extremely budget friendly. This most universal (q)PCR plate fits the majority of the (q)PCR cyclers. Products are designed and manufactured by BIOplastics in the Netherlands. The release of our new 48 x 0.1 ml semi-skirted low profile (q)PCR plates which fits ABI StepOne, Veriti, Bio-Rad CFX, Chromo-4, Opticon, Mini Opticon, Eppendorf Real Plex and many other height adjustable lid cyclers is appointed. BIOplastics celebrates this year its 10 year Anniversary and wants to thank you for your confidence in our products and services. In the past 10 years BIOplastics has grown from a startup injection molding company to one of the largest manufacturers of high qualitative (q)PCR plastics worldwide. In addition to sales offices in the Netherlands, USA, and China, BIOplastics has a distributor network in more than 40 countries! To celebrate our anniversary every order over € / $ 250 to be accompanied by a free anniversary version of the Multo-work rack system. This promotion is valid from July 20th through December 1st, 2010 (different rules may apply for your local distributor). The Multo-Work rack system can be used in pipetting procedures and for storage and shipments of (q)PCR vessels and plates. 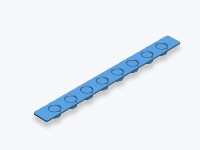 The racks are stackable and can be used in temperature ranges of -200°C tot 100°C. Proudly we release our new 0.1 ml Low Profile qPCR single tubes and strips with single attached optical caps which fit Roche 480, ABI Fast Cyclers, 7500, Veriti, StepOne, StepOnePlus, Bio-Rad CFX cyclers. BIOplastics, manufacturer of superior (q)PCR disposables, has released its NEW, 2010 BIOplastics (q)PCR catalog. The release of the 2010 catalog is accompanied with a dynamic interactive search engine on the website, which enables easy searching for a universal (q)PCR disposable to fit your (q)PCR cycler range. By doing so you can substantially reduce the number of products and suppliers while improving your reproducibility. As a manufacturer we can provide you with technical knowledge and support resulting in improvement of reproducibility and controllability of your (q)PCR results. The base of this quality improvement is related to the brand and model independent, standardized performance of (q)PCR cyclers and BIOplastics disposables. These improvements can be achieved without additional costs, and will give better results and reduce costs. We are proud to officially release our 96 well Lasermark-coded Thin-wall (q)PCR Plates, which fit all Applied Biosystems (ABI) cyclers and qPCR cyclers. The plates are extreme uniform, flat, stackable and incorporate BIOplastics’ latest BPLPM technology ensuring superior performance, reproducibility and marking performances. BIOplastics BPLPM technology (BIOplastics particle mix) is inert to the (q)PCR process. In addition these particles by nature increase signal to noise ratio’s in Real Time PCR applications. All 96 well plates are permanently laser marked with a unique ID, wells are laser marked A to H and 1-12 and also available with additional laser barcodes. We are proud to now officially release our new 384 well Lasermark-coded Skirted Thin-wall (q)PCR Plates which fits Roche, ABI, Eppendorf and all other (q)PCR cyclers. The plates are extremely uniform, flat, stackable and incorporate BIOplastic’s latest BPLPM technology ensuring superior performance, reproducibility and marking performances. BIOplastics BPLPM technology (BIOplastics particle mix) is inert to the (q)PCR process. In addition these particles by nature increase signal to noise ratio’s in Real Time PCR applications. All 384 well plates are permanently laser marked with a unique ID, wells are laser marked A to P and 1-24 and also available with additional laser barcodes. Lasermark-coded Skirted Thin-wall 384 well (q)PCR plates are available in boxes of 40 plates (5 bags of 8 plates). Last year we introduced our innovative screw cap tubes, which can be used over the impressive temperature range of – 200 °C to +100 °C. Due to the fact that some customers prefer “Easy Closure-one-hand opening” of screw cap tubes, BIOplastics has designed an Easy Closure Cap for the Screw Cap tube range. Customers can now opt for either Regular Closure or Easy Closure. 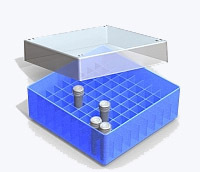 For robust applications such as long term storage: >= 3 years below - 60 °C or incubation at >= 95 °C for >= 2 hours, one should opt for the regular closure caps. For less robust applications: <= 3 years higher than -60 °C or less stringent incubation <= 100 °C, <= 1.5 hours, one can opt for the Easy Closure Cap. Both types of caps incorporate BIOplastics’ non leaking Smart Closure Cap Technology. The Easy Closure Cap is manufactured from a completely different material. All types of Screw Caps and Screw Tubes are available in 10 different colors, DNase, RNase, Pyrogen, Metal and ATP free. These strips are universal and fit all thermocyclers which require standard profile strips. They even fit the ABI 7300 and 7500 Cyclers. The strip is lightly frosted and therefore enables signal enhancement in qPCR, without compromising the view through the tubes. The Robust 12-Tube strip is particularly useful since the easiness of left to right pipetting, typically used in manual handling, is supported. For closure we recommend the wide area indented flat 12-cap strip for qPCR (B57821) and the indented flat 12-cap strip for PCR (B56501). These plates are universal and fit all thermocyclers which require standard profile products. They even fit the original ABI 7300 and 7500 cyclers as well as sequencers. So with one type of plate you can serve about 90% of the thermocycler market! The plates are lightly frosted and therefore enable signal enhancement in qPCR, however still allow to view the content of the tubes.For closure we recommend the wide area indented flat 8-cap strip for qPCR (B57801) or OptiSeal. The EU Semi Skirted Thin-wall 24 x 0.2 ml plate,cuttable and color code-able*. These plates are universal and fit all thermocyclers which require standard profile products. They even fit the original ABI 7300 and 7500 cyclers. So with one type of plate you can serve about 90% of the thermocycler market! The plates are lightly frosted and therefore enable signal enhancement in qPCR, however still allow to view the content of the tubes. For closure we recommend the wide area indented flat 8-cap strip for qPCR (B57801) and any other BIOplastics cap strip. If you use strips and your use pattern has an average of 3 strips per run than this product is an excellent and price attractive alternative to your current strip. The EU Semi Skirted Thin-wall 96 x 0.2 ml plate, breakable, cutable and color code-able*. These plates are universal and fit all thermocyclers which require standard profile products. They even fit the original ABI 7300 and 7500 cyclers. So one type of plate fits about 90% of the thermocyclers market! The plates are lightly frosted and therefore enables signal enhancement in qPCR, however still allows to view the content of the tubes. For closure we recommend the wide area indented flat 8-cap strip for qPCR (B57801) or OptiSeal. These strips are universal and fitting all thermo cyclers which require standard profile strips. They even fit the original ABI 7300 and 7500 adaptors.The strip is lightly frosted and therefore enables signal enhancement in qPCR, but still allows you to view through the tubes. For qPCR applications we recommend closure by means of the wide area indented flat 8-cap strip or Opti-Seal and for regular PCR robust cap-strip B75701. The new 8-tube strip is a stock item. As a consequence of increasing market demands we now introduce our new CRYO-STORAGE boxes which can be handled in the range of -180°C to +110°C . These boxes are used in a wide range of applications and fit most commonly used (freezer) racking systems. We are proud to officially release our new innovative EU Extra Long 200ul Pipette Tip (For Diagnostic & Clinical procedures). These tips have excellent performance and handling properties. We are proud to now officially release our new innovative screw cap tubes. These screw cap tubes use a Smart Closure Technology to give a gas tight closure without O-ring and thereby prevent leaking tubes, even when using organic solvents. The caps and tubes are both available in 10 colors, so up to 100 color combinations are possible. The screw cap tubes are available in 0.5 ml, 1.5 ml and 2.0 ml format, both conical and free standing.